Persona Brand Makeover: What’s unique about me? Personal Brand Makeover: What’s unique about me? 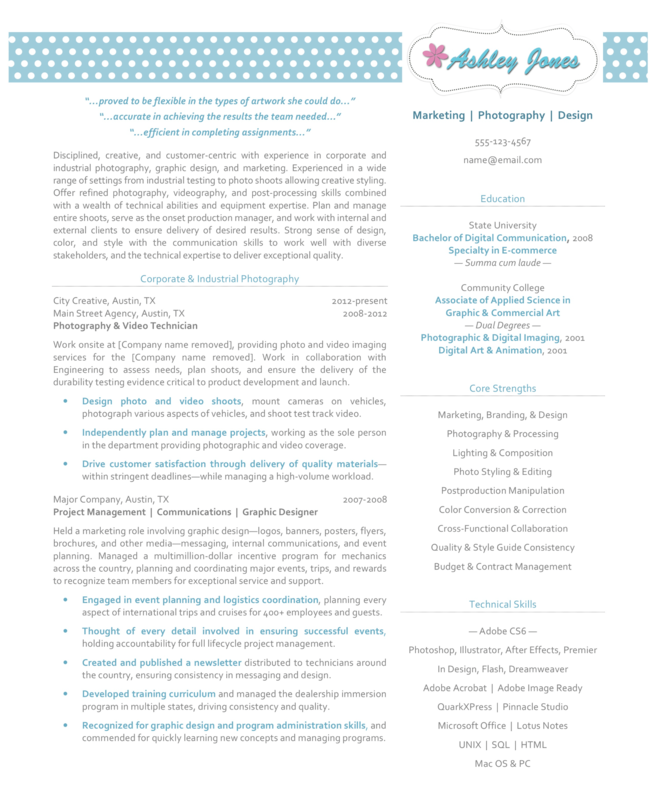 Ashley came to me seeking a creative position in a corporate marketing or agency setting. Her background included photography and design, with her most recent experience involving highly technical photography work not allowing for much creativity. On the side, Ashley had started her own more creative photography business as well as engaging in work with a local wedding photographer. Ashley’s original résumé lacked creativity. Given she was pursuing a creative role, there was nothing about her original résumé that would show an employer her creative side. Ashley had also presented her employee engagements with her entrepreneurial roles, provoking questions as to her current career target versus her desire to promote her own ventures. In addition, Ashley’s résumé was unnecessarily long based on the format, redundancy, and presentation of perhaps too much information. Strategy was key in the development of Ashley’s new résumé. Not only did the format have to “pop,” but also the content had to explore both her creative and technical skills. It was also imperative that the focus of Ashley’s résumé be the employee-employer engagements. By removing the hybrid focus between employee and entrepreneurial ventures, we could avoid an employer thinking Ashley would be moonlighting on the side, biding her time until her business picked up and she could leave to pursue that full-time. As you can see from Ashley’s new résumé, 100% of the content explores her impressive professional engagements, being sure to “translate” functions performed in the most transferable language possible. 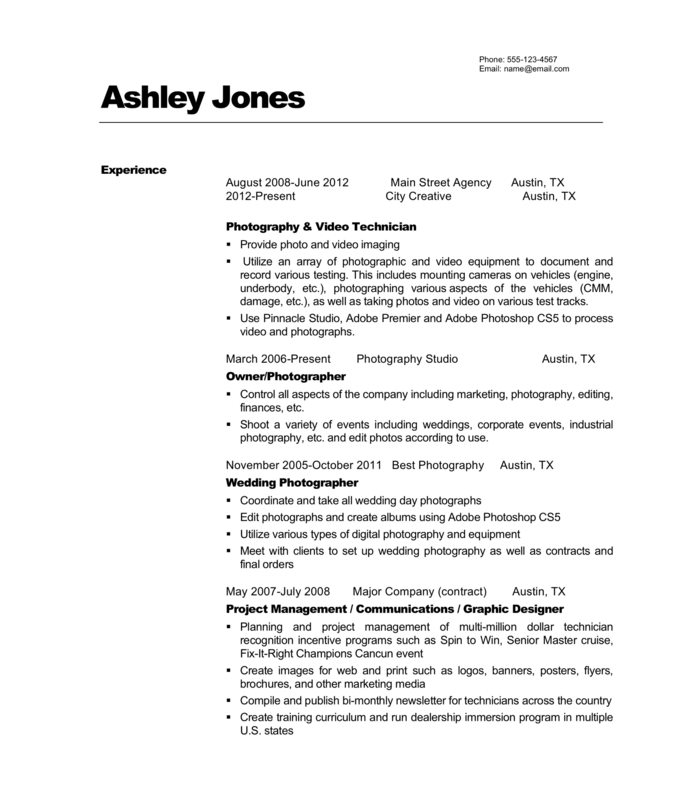 In addition, Ashley’s résumé shrunk from two pages to only one page. The length of Ashley’s résumé was important as we wanted to create a concise marketing document, which succinctly and effectively told the story of her professional career. Given Ashley had performed similar duties in her professional engagements as in her entrepreneurial ventures, by not presenting her self-employment we were not doing her candidacy a disservice. The right side of Ashley’s résumé showcases her education, strengths, and technical skills. By using this more creative format—color to add emphasis, and an artistic yet professional design—Ashley is truly now practicing what she preaches.